Strelna, one of the oldest suburbs of Saint Petersburg, is situated 19 km from the town, on the south shore of the Finnish Gulf. 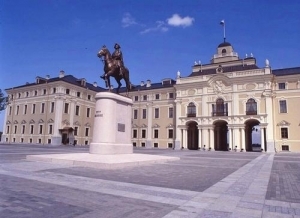 Under Peter the Great the former Sweden mansion of the so-called Strelina Myza was used as the royal resting palace. There the tsar used to stay on the way from Saint Petersburg to the fortress Kronstadt and Oranienbaum. Inspired by the picturesque surroundings of Strelna, Peter the Great conceived the creation of an estate that was to surpass in its beauty and splendor the best residences of European monarchs. The tsar planned it to be the main naval residence and wanted to erect a magnificent palace, arrange beautiful cascades and grottos, and lay out a wonderful park. The projects of the future residence were worked out by the prominent architects — Leblon and Rastrelli. Peter the Great acquainted himself attentively with both and chose the fresher project of Leblon. The French architect fell to work immediately, but the sudden death of the architect prevented this project from being carried out to the full. Leblon was replaced by architect Nikolo Miketti, who in 1720 started the construction of the Strelninsky Palace. The construction was being carried out at a rapid pace for a year when the Emperor switched his attention to nearby Peterhof, which had a more advantageous location. In 1723 Miketti left Russia and the palace was finished by a group of Russian architects headed by M. Zemskov. After Peter's death Strelna was neglected and gradually went into a decline. In the duration of the 18th century it was used not as a royal residence but as utilities. The gardens and hothouses of Strelna supplied Russian emperors with the best fruits and vegetables and the giant vaults of the palace were used as wine-cellars. The revival of the Strelna palace and park ensemble happened at the beginning of the 19th century when the Emperor Paul I presented it to his son, Grand Prince Konstantin. For the reconstruction of the Great Palace that was tremendously damaged by fires of the 1830s Konstantin invited prominent architects Voronikhin and Ruska. Then the construction of the Strelninsky palace that lasted for almost 85 years was complete. In 1847 Strelna became a summer residence of another Grand Prince Konstantin, the son of Nicholas I, and since then the palace and the park were officially called Konstantinovsky. After the October Revolution palaces and parks of Strelna were nationalized and the personal possessions of the august persons, books, documents, luxurious collection of paintings and pottery were dispersed to different museums of Petrograd. For a certain period palaces housed children labor school. During World War II the palace and park ensemble of Strelna was terrifically damaged. As a result of massive bombardment and fire, the buildings were almost razed to the ground. For decades the park and the palace lay in ruins. But after the many years of neglect, when the former summer imperial residence was nearly to sink into oblivion the miracle happened and the architectural masterpiece included by UNESCO in the list of the monuments of world historical and cultural heritage was finally noticed by the authorities. The reconstruction of the palace began in November 2001, and by the celebrations of the 300th anniversary of Saint Petersburg foundation the ensemble was totally restored and appeared before the public in all its glory. The former tsar's residence obtained the status of the State Complex «Palace of Congresses» that is used as a State residence, museum and business center at the same time. The Aliot Hotel is situated in the Kirovsky district of Saint Petersburg, close to the Kirovsky Zavod metro station.